Below are horse trailers with living quarters for sale on eBay. There is usually a choice between both new and used trailers. For a list of common terms associated with horse trailers that have living quarters, please scroll down beneath the trailers for sale. 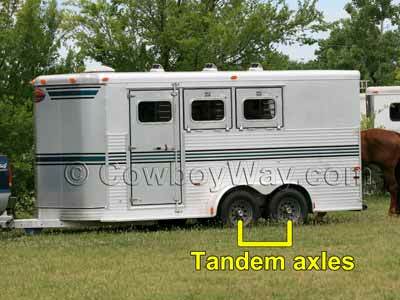 Below: A 3-horse slant horse trailer with living quarters, awning, rear ramp load, and tandem axles. Gross Vehicle Weight Rating (GVWR) - This is the maximum amount of weight a horse trailer is rated to carry including cargo, mats, equipment, accessories, attachments, fluids, and whatever else including the weight of the trailer itself. Living Quarters - A horse trailer with living quarters is a trailer designed to haul horses that also has an area for people to live. While the accommodations for both the people and the horses vary, the living quarters area is typically designed for one or several people to cook, eat, use the restroom, shower, relax, and sleep comfortably for days or weeks at a time. The size of the living quarters and exactly what it does or doesn't include can vary widely from one trailer to another. Long Wall - With some horse trailers that have living quarters, the living quarters will have one outside wall that is longer than the other. (This is particularly true of slant load horse trailers.) The long side will, logically, be called the "long wall" while the other side will be referred to as the "short wall." Short Wall - In some horse trailers with living quarters (particularly slant loads), the living quarters will have one outside wall that is shorter than the other. The short side will, logically, be called the "short wall" while the other side will be referred to as the "long wall." 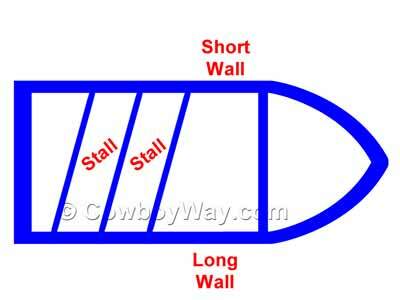 Below: A diagram showing the short wall and long wall in a horse trailer. Tandem Axles - A tandem axle trailer has two sets of axles, one in front of the other. Two sets of axles instead of one allows for more tires, giving the trailer the ability to carry more weight and increasing stability. Below: Tandem axles on a 2-horse bumper pull horse trailer. 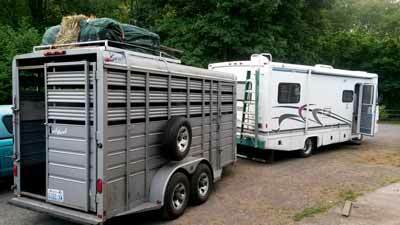 Below: A horse or stock trailer without living quarters being pulled by recreational vehicle. Weekender, or Weekender Package - A horse trailer with a "weekender package" is a type of horse trailer with scaled down living quarters when compared to a horse trailer with full living quarters. Instead of being designed for the living quarters to be suitable for living in for days or weeks, "weekenders" have living quarters designed to be comfortable for shorter periods, such as a weekend. Exactly what the differences are between full living quarters and a weekender varies: Typically, though, weekenders have a smaller living area and scaled down living amenities: They may or may not have a stove or refrigerator, restroom, shower, bed, or other items common in full living quarters. If they do have them, they might be smaller and not as full-featured as the ones in trailers with full living quarters.